LOS ANGELES, California (CNN) -- Kanye West may be able to take time off to think about his life after all now that his concert tour has been canceled. Kanye West has canceled his "Fame Kills" tour with Lady Gaga. It was announced two weeks ago. Concert promoter Live Nation said Thursday that West's concert tour with Lady Gaga, titled "Fame Kills," has been canceled just two weeks after it was announced. The reason for the cancellation was not revealed. West told NBC's Jay Leno last month, before the tour was officially announced, that he planned "to take some time off" in the aftermath of his MTV Awards show embarrassment. The three-month, 34-show tour across the United States and Canada was to start next month. Tickets went on sale last week. Live Nation said people who bought tickets could get refunds at the point of purchase. Tickets purchased online and on the phone will be refunded automatically, the promoter said. 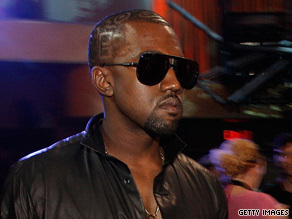 West caused a ruckus at the MTV Awards last month when he put down his bottle of cognac, jumped on the MTV Music Video Awards stage and grabbed the microphone from singer Taylor Swift as she was giving an acceptance speech. West calls Swift with "sincere apology"
West, who apologized the next day on "The Jay Leno Show," seemed to blame his erratic behavior on the lack of time he had to grieve his mother's death two years ago. "I deal with hurt and, you know, so many, you know, celebrities, they never take the time off, and I've never taken the time off to really, you know, I just, music after music and tour after tour on tour," West told Leno.